If you want to feel like royalty on your wedding day, you need to see these beautiful castle wedding venues in Cornwall. OK, every bride and groom wants to feel like royalty on their wedding day, but if you want to kick things up a notch, why not book a castle or fort? Hosting your celebration at one of these historic castle wedding venues in Cornwall will make your celebration seem like something out of a fairytale, and give you the opportunity to be a Monarch for a day. Here are a few castle wedding venues in Cornwall fit for royalty. 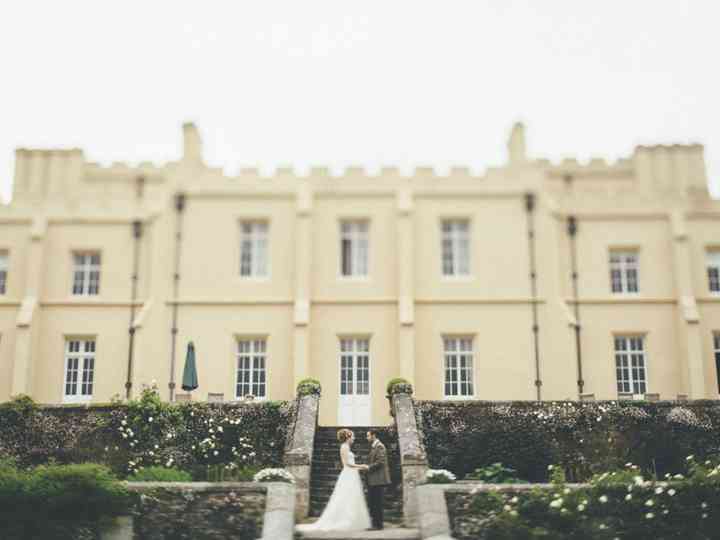 Pentillie Castle & Estate is definitely one of the most gorgeous castle wedding venues in Cornwall. Its set among a 2000 acre estate on the bank of River Tamar, giving you beautiful backdrops for your wedding photos. It has several indoor and outdoor event spaces that are licensed for ceremonies and even more options for your reception. If you’re hosting your wedding inside, the capacity is 60 people, but if you want to bring your party to the great outdoors you can bump your guest list up to 200. This castle wedding venue in Cornwall has everything you could want for your big day: breathtaking views, elegant event rooms and accommodations where you and you guests can stay the night after partying. Tregenna Castle Resort is licensed for ceremonies both indoors and outdoors and has six unique spaces to choose from for your celebration. Its largest has room for 250 guests, so you should be able to fit all of your nearest and dearest. Pendennis Castle was built in 1540’s and has maintained much of its original charm over the years. You can tie the knot in the spacious Castle Keep, or if, you’re looking for something a touch more intimate, in the Melvill Room inside the Royal Artillery Barracks. After your ceremony has wrapped you can head to the Killgrew Room in the Royal Artillery Barracks (which can accommodate 120 guests) for a wedding breakfast and then move to a marquee tent outdoors to dance the night away. The Castle Bude a scenic seaside castle wedding venue in Cornwall, was built in the 1830s offers some of the best coastal views in the county. For your ceremony, you can make use of one of its two intimate event spaces, the Willoughby Gallery (which seats up to 60 guests) or the Blanchminster room (which seats up to 24 guests). Once you’ve said your vows, you can move out to the lawn for a larger reception in the open air or under the cover of a marquee tent. The staff here will help you plan all aspects of your big day and take care of food and seating, so you won’t have to spend your time hunting down suppliers and rental companies. Looking for something a little different? This Napoleonic fort is one unique wedding venue in Cornwall you need to see. Inside Palhawn Fort you’ll find two event spaces (both licensed for ceremonies) that will transport you and your guests back in time. There’s the Grand Napoleonic Hall (which can fit up to 120 guests) and the Emperor’s Room (which can fit up to 30 guests), both are equally wedding-worthy, so you can’t go wrong either way. If you want to host your reception here too, you can have it in a marquee on the lawn or indoors.